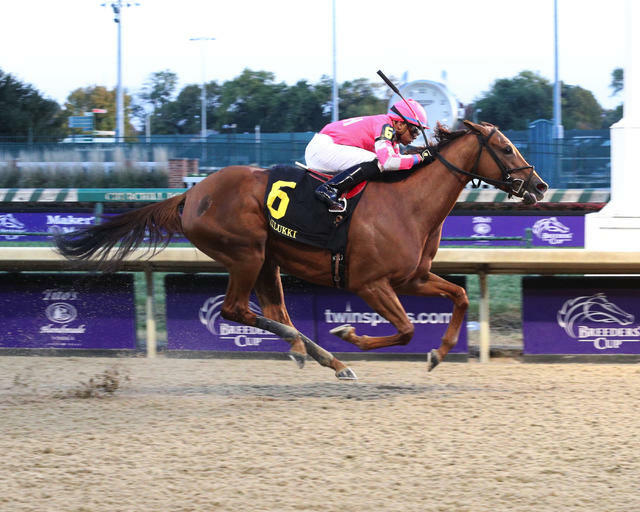 Corms Racing Stable and R A Hill Stable’s Divine Miss Grey rallied from just off the pace to win the $200,000 Chilukki Stakes (Grade II), the final race on Breeders’ Cup Saturday at Churchill Downs. With jockey Manny Franco in the saddle, Divine Miss Grey tracked the early pace of head-strong Bixby Lou through opening fractions of :23.90 and :47.30. At the three-eighths pole, Divine Miss Grey assumed the lead and held off the late charge of Berned by 1 ¼ lengths. Divine Miss Grey completed the one-turn mile in 1:36.64. Based at Belmont Park with trainer Danny Gargan, Divine Miss Grey returned $3.60, $2.40 and $2.10. Berned, at odds of 5-2, returned $3 and $2.40 and Pricedtoperfection rallied from last to finish third and returned $2.80. Divine Miss Grey is a 4-year-old chestnut filly by Divine Park out of the Friends Lake mare Seattle Grey. The 11-time winner was bred in Kentucky by Brereton C. Jones. Shenandoah Queen and Bixby Lou completed the order of finish. Racing returns Sunday at Churchill Downs with a first post of 1 p.m.